One of the reasons that I take part in Walk the Region is to re-examine the prejudices we sometimes hold about our city. Many of us Montrealers associate “the 514” – which is to say everything on the island – with enlightened, bustling, metropolitanism, and discount “the 450” as a bland and soulless suburban wasteland. But once you set foot outside the most central neighbourhoods, it turns out that area codes are far from a reliable predictor of built form. 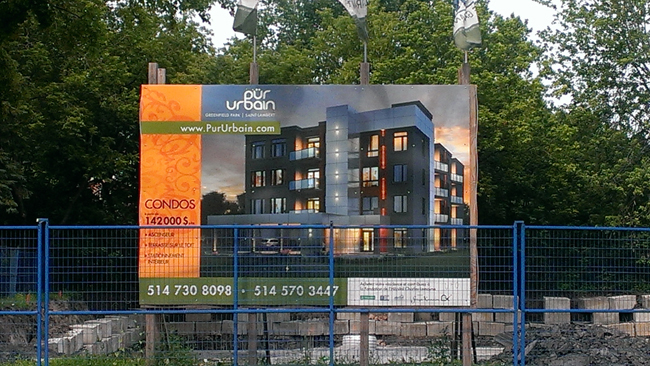 Look no further than these flashy billboards advertising new single family dwellings dot the outskirts of the Faubourg Contrecoeur development: The suburban single-family-dwelling dream is alive and well on the island of Montreal. 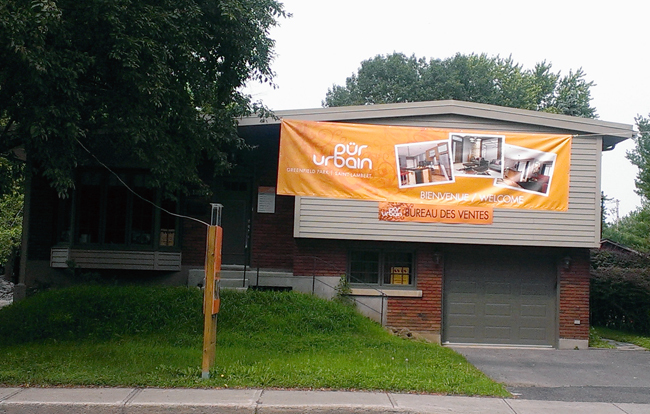 Meanwhile, across the bridge in Saint-Lambert, 1950s era bungalows are being recast as urban condos. Unlike the city, the metropolitan region is not defined by political borders nor physical boundaries nor historical convention. Truth be told, it’s a rather nebulous concept whose delineation requires in-depth statistical analysis and pages of graphs and formulas. Put simply, the metro region’s boundaries are defined by the proportion of people who commute between the core and fringe areas. That means the metropolitan area can be likened to a fabric woven from its’ inhabitants’ trajectories; its perimeter may change to reflect how people actually occupy and move through space. That’s why I find it to be an interesting scale for thinking about transportation, economic development, and environmental sustainability, and why it’s worth getting to know the metropolitan region. But things can get a little surreal when you take into account that Montreal’s metropolitan area is composed of 82 separate municipalities, which often end up competing to attract the employers, commercial centres, and housing developments that bring in property tax dollars. When I see ads for single-family homes in the borough of Mercier-Hochelaga-Maisonneuve, I suspect that Montreal is trying – and probably failing – to compete with the suburbs at their owngame. When I see the south shore capitalizing on its urban qualities and proximity to the downtown core, I am gladdened that the desire for city-living has spanned the Saint-Lawrence river. But then again, I am biased – I’ve always been a city-lover.